The small half-track D7, designed during the mid-thirties, was produced for the German army until 1944. Several thousand units were built to tow light artillery pieces and rocket launchers. The vehicle itself carried an anti-aircraft gun and was very mobile. The vehicle had a cargo capacity of 1.5 tons. It was used extensively in all theaters. The Sd.Kfz.10/5 version was equipped with a 2cm gun Type 38, which was also used against ground targets. This Italeri kit from the Italian manufacturer comes in a shrink-wrapped tray and lid type box. 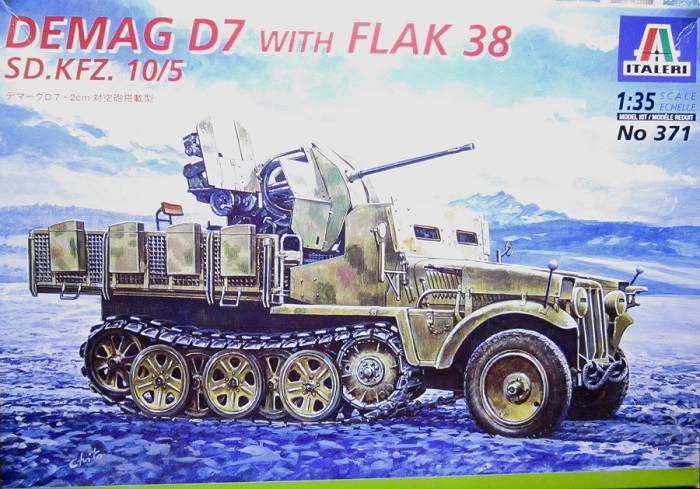 The box art shows the Demag D7 parked on a road with what looks like snow cover and with mountains in the background. A side panel of the box gives a one-paragraph history of the vehicle in 8 languages, including English. All are individually marked with illustrations of the flags for their various countries. The other side panel continues with the history for 4 more countries. It also gives a copyright for 1999 and says that the kit is not suitable for kids under 3. 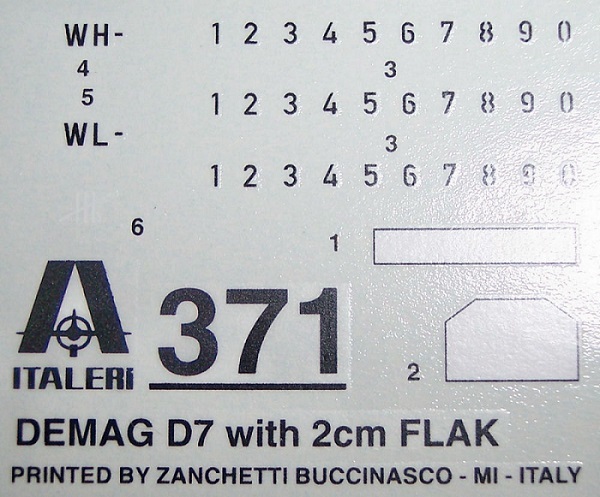 Italeri’s street address in Italy is provided here also along with a listing of Model Master brand of hobby paints numbers, but not what these colors are. The kit is intended for modelers over 10 years of age, but not for children under 3 due to small parts they might swallow. 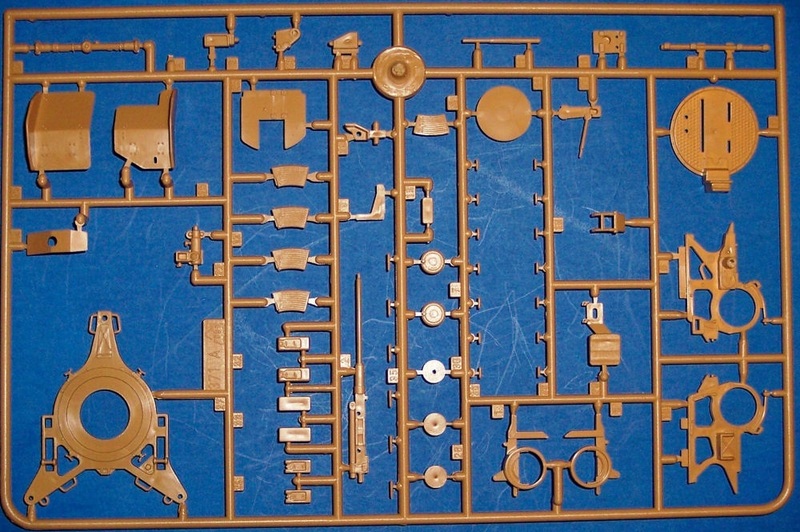 Inside the box are two large and one medium sized light tan trees of parts, a sheet of nylon screen, a small tree of clear parts and a small decal sheet. The instructions and a small sheet of “Important information concerning this kit” (in 20 languages) completes the kits contents. None of the trees are cello bagged. This is a fault in most all Italeri kits I have. I wish they would cello parts to keep parts on them from rubbing and breaking off the sprues. Especially, the clear parts to keep them from getting scratched. The instructions consists of a large sheet that accordion folds out into 10 pages of 7 5/8” x 13” format. Page one gives the history of the Demag D7 in 13 languages. Page two has paragraphs labeled “Attention – useful advice” in 11 languages. 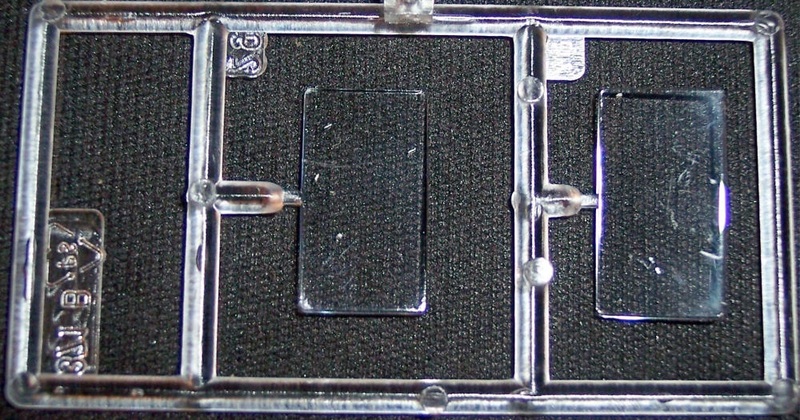 This followed by a drawing of large letter A parts tree, small letter B tree (clear parts) and the piece of nylon screen – letter E. There is also a drawing of the international assembly symbol for drilling holes. Page three begins a listing of Model Master brand paints, suggested for finishing the model. This is followed by the parts tree drawing for trees letter C and D, which are co-joined together. The bottom of the page has the first assembly step drawing. Pages four through the top of page 7 give a total of 12 assembly steps, mostly for the main part of the vehicle. Page 7 then goes into a new numbering series for assembly steps showing how to mount ammo cans and the nylon screening to parts. The bottom of the page shows a line drawing for tree letter AA. This tree is all the parts for the 2 cm anti-aircraft gun. Here assembly step numbering picks up again with step 13 to step 16, all for the assembly of the gun and side walls of the fighting compartment that have been screened and ammo cans mounted. This spreads to page 10, at the bottom of page 10 there is a single side view drawing of the D7 calling out a camouflage pattern of Model Master 1567-flat tan, 1710 – FS34079-dark green and 1701-FS30117-military brown. This is followed by decal instructions in 9 languages. The decal sheet has white license plates with individual black numbers and either WH for Wehrmacht or WL for Luftwaffe and what appears to be a division symbol for Hitler Jugand. However, the marking instructions do not show any of this in the single side profile drawing. So, consult your references on this vehicle. Letter B tree is the small clear parts tree. I holds 2 window parts. Letter E is the piece of black nylon screen. Tree letter AA contains the 2 cm anti-aircraft cannon. There are no crew figures provided. This is one neat German vehicle. Highly recommended. Kit was courtesy of my local hobby shop years ago.